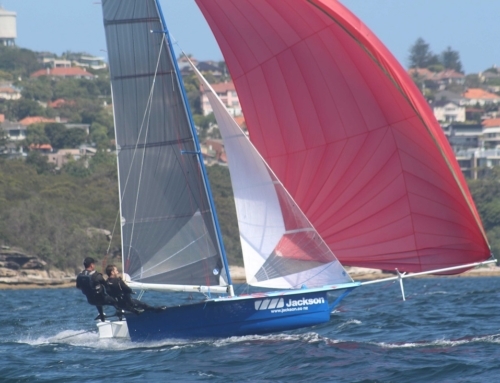 The 12′ Skiff fleet, racing in the 2016 Interdominions, spent some solid hours on the water today completing both the Invitation Race and the first race of the series. 25 boats from Aussie and New Zealand are at the event which is hosted by the Auckland Skiff League. C-Tech (NZL), skippered by Alex Vallings with Fraser Brown at the pointing end, had a glamour day winning both races over the line. At this point Vallings and Brown are probably hoping that the curse of the Invitation Race is just a myth from the past. Unfortunately for Hamish Hey and Adam Scott-Mackie the regatta didn’t start so good. Hey has been organising this event for the last 6 months and didn’t deserve his mast having a meltdown during the Invitation Race. Luckily he was able to bounce back and get to the start for first race. Race 1 was a windward leeward course set in a constant 12 knots. The fleet had their number 2 rigs in but the conditions just didn’t provide enough grunt to get the boats skidding along with airborne moments. But it was consistent which was a great way to start the regatta. C-Tech owned it from the start and led the entire race. 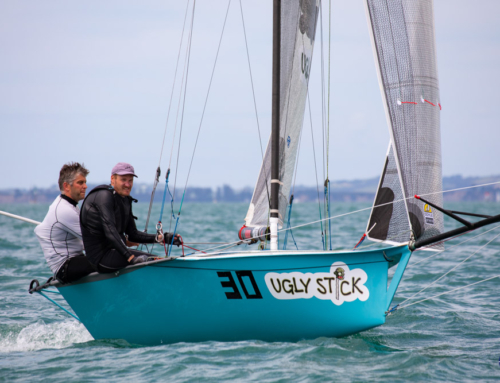 Geotherm (AUS) with Bretty Hobson on the fun stick and Bill Lusty up front were sitting in second for most of the race only to have a complete mere on the last mark rounding and had an epic nose dive and swim. Unfortunately this wasn’t caught on camera so may have been slightly exaggerated. With Geotherm swimming, it was Roger Barnes and James De Lisle on As Good As It Gets (NZL) who snuck into second leaving Geotherm in their wake. So after one race, the Kiwis lead the Interdoms on 133 points and the Aussies are on 166. Race 2 is scheduled to kick off at 1400 hours on Monday 4th January. If you are in Auckland and want to have a gander that this impressive fleet, then push some fisherman out of the way and get to Orakei Wharf. View more photos via the Auckland Skiff League Facebook Page.